A few months ago I posted some details about a fun collaborative project that Andy (from Tales from The Maelstrom) and I were planning. As of today the project has moved on to the next, fully tangible stage. The “Slaanesh Captive” that I received from Andy, an homage to the lovely Paul Bonner illustration from the Space Marine (Epic) first edition rulebook (above). The brief for the models to be exchanged was intentionally loose two word description: “Slaanesh Captive”. 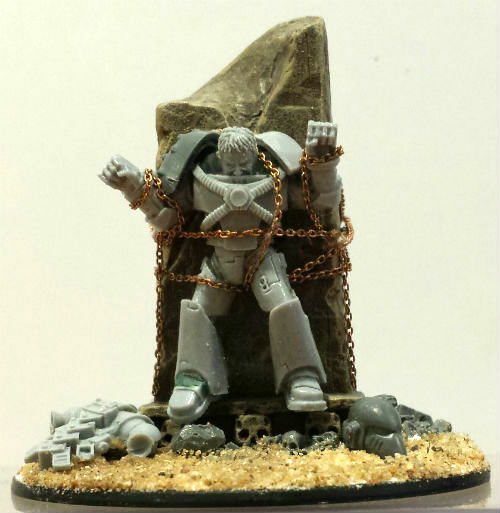 Whether the subject was a captive of Slaanesh or something Slaaneshi that was in captivity was left up to the converter. 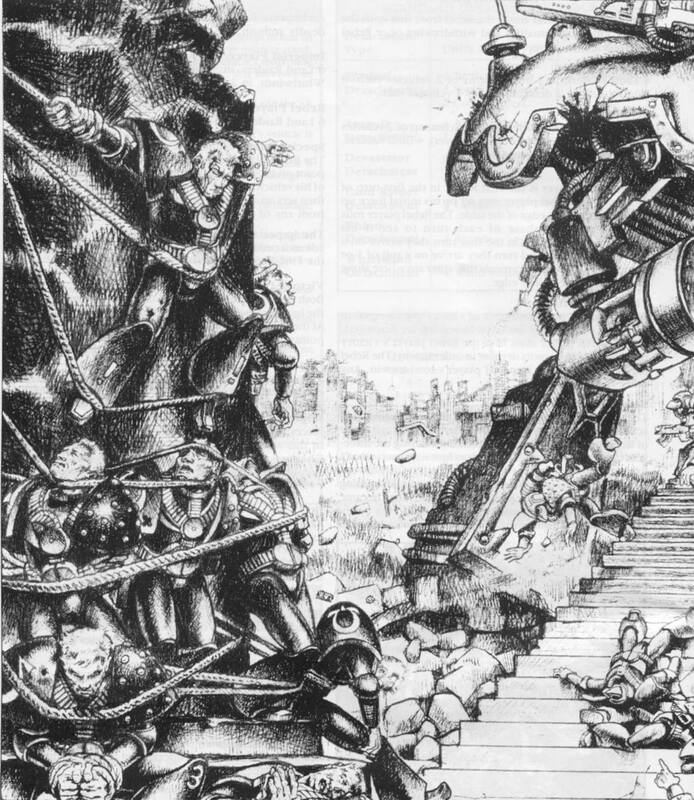 Andys approach is a reference to a classic, atmospheric Paul Bonner illustration from the original Space Marine (Epic) first edition rulebook. The captive marines in that image are Ultramarines, so I may reference that in the painting. I will have to have a think for a couple of days first. The model that I sent in exchange for this guy featured in a Tales From the Maelstrom post yesterday. Check out Andys update on the project here. Eventually battle reports featuring the exchanged models will appear on each of our blogs, possibly with scenarios linked in some thematic way, but thats a little while off yet. The next update to this project will be images of the miniature above painted. Many thanks to Andy for the time and effort that he has put in to this project so far. Nice one Andy! Two excellent models can’t wait to see them both painted up. Both are fun pieces that prompt their own narratives. Time spent on models like that always pays off I think. The different approaches to the subject will lead to some different scenarios too. In turn that is likely to effect which miniatures get bumped up the to-do queue too. It’s good to shake things up a little like this I think, plus it’s fun. Thanks for the feedback axiom. I’ts great to see you doing another collaborative project. Excellent concept.. The brief for this one is slightly different for our collaboration last year, but the two have more similarities than differences. Where did the chain come from ?